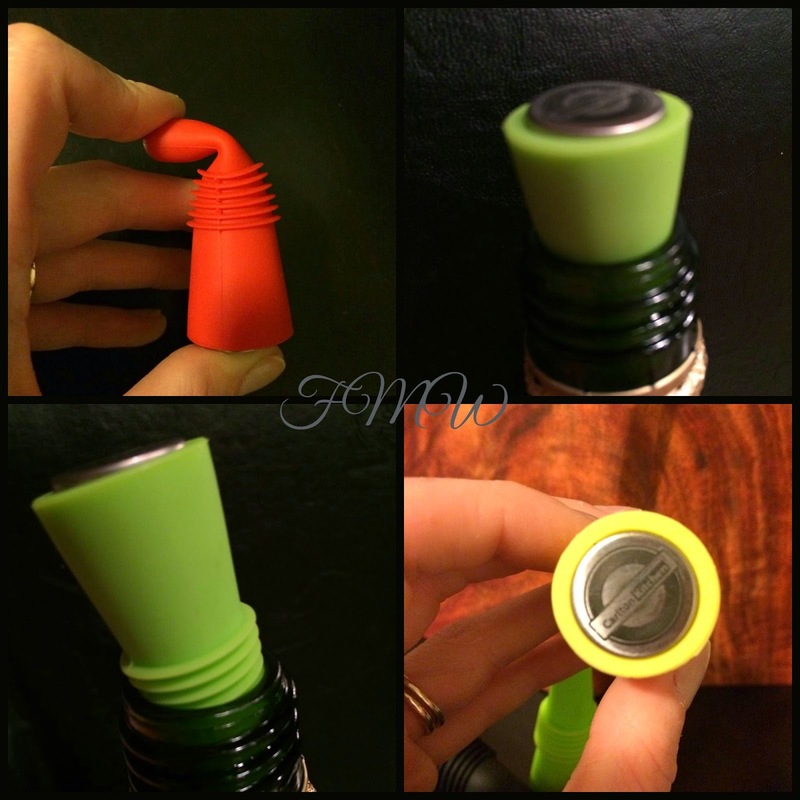 Frugal Mom and Wife: Carlton Kitchen Bottle Stoppers Review! 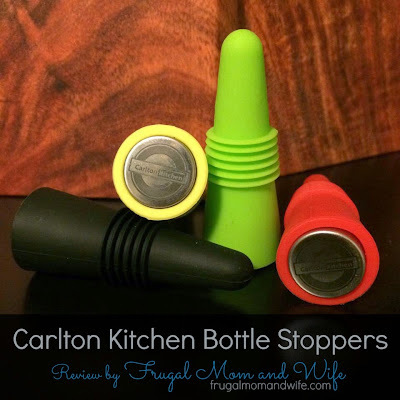 Carlton Kitchen Bottle Stoppers Review! The Carlton Kitchen company's silicone Wine Bottle Stoppers are the perfect solution to your beverage storage problems. These are simple, easy to use, durable, ECO-friendly and fun tools to have around. They aren't going to take up valuable kitchen space and are always there when you need them. Whether you are operating a tasting room and have several partial bottles that need stored, or you're a amateur wine aficionado who enjoys some of wine's health benefits one glass at a time, these are a perfect solution! • Use for olive oil, balsamic vinegar, soda, whatever! *Plus You Get Their Wine & Food Guide, absolutely free!! I will admit I am a sucker for a fancy or adorable bottle stopper. That can get me into quite a bit of trouble. The metal ones tend to get stuck in the bottle and are pretty hard to get out. My upper body strength cannot handle the suction within the bottle resisting the release of the topper. What a headache, all I wanted to do is keep the contents of the bottle fresh. 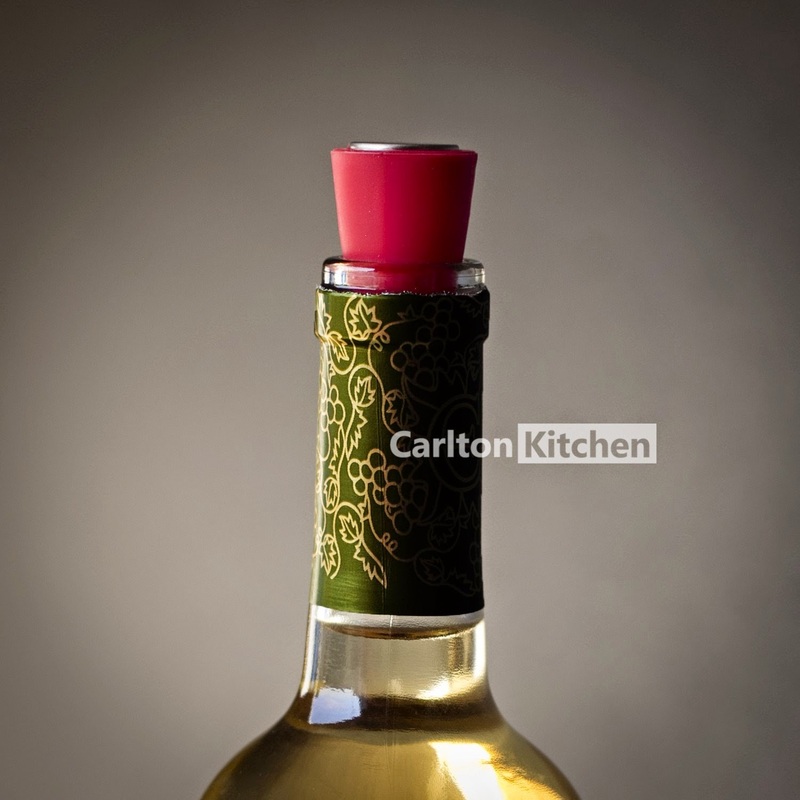 What makes the Carlton Kitchen Bottle Stoppers so great is that they are durable but bendable. This provides the vacuum seal you need but allows you to maneuver the topper right out of the bottle. Available in multiple colors to accent your decor, setting or just your overall style. Honestly I cannot wait to see what else Carlton Kitchen comes up with. These toppers are for sure a must have for any wine lover or cork bottle user. Trust me, you will be glad you did! I really love the vibrant colors of these "corks" and that it keeps your wine fresh! Nothing is worse than trying to stuff a cork back in! These are really cute and I love all the colors they come in. I have these and I love them. They work so well. These would definitely save me from a lot of hard work getting tops off!! I will have to check these out and not only for me! Those are really nice and they look easy to clean too. These are gorgeous and far nicer than boring silver stoppers. Love them. These are kind of fun and contemporary looking. I would use that for my wine bottles. I really like how these are air tight. The ones I'm using now wiggle around an awful lot which is probably why the wine I thought I had to drink in the fridge went rancid. These are better! That's way cool! It looks like a great idea to keep things fresh. Such a handy tool! I love the pretty colors. A nice this to have for someone like me who loves wine! I needed this wine bottle stopper. Last time I bought a bottle of wine I ended up drinking way more than I wanted to drink. I love that this is a snug fit! Looks like it will keep wine air tight and fresh for quite awhile. I like these over the traditional bottle overs. Love the colors! These are so versatile. They're pretty, too! We would use this on olive oil.